I know I haven't been posting these last couple of weeks, but I have been doing LOTS of stamping. 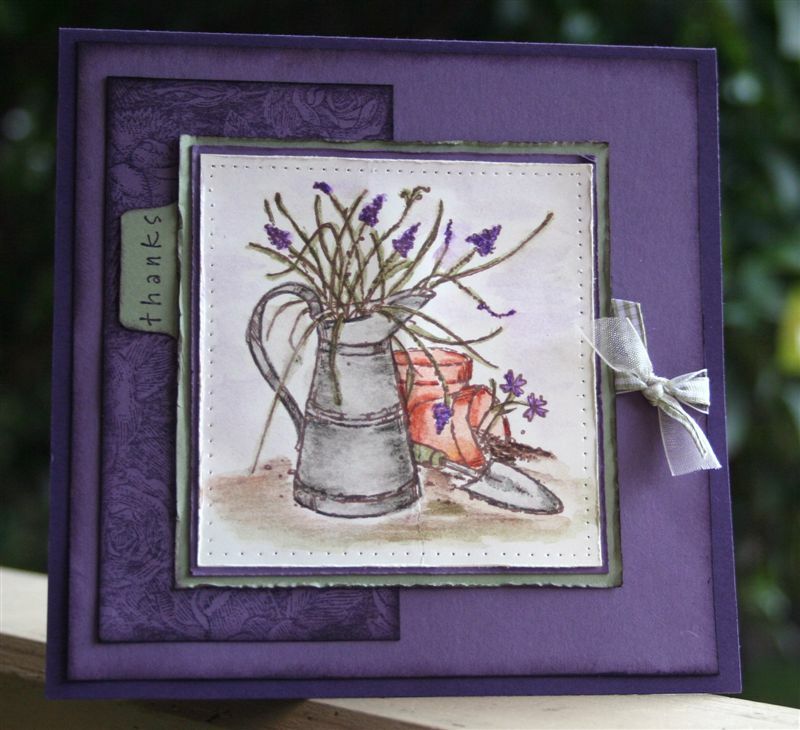 I have so many new cards and stamp sets to show you. I'll be back January 1st with the first posting of samples. 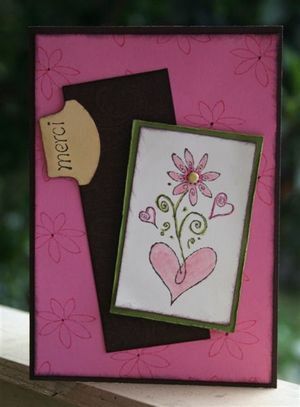 I'm aiming for a card a day in January to celebrate Sale-a-bration! Sale-a-bration starts January 1st - choose an exclusive free stamp set with each $100 you spend! Spend $100 choose one set, $200 choose 2 free sets etc. Gorgeous sets that will never be in any future catalogues. If you don't have a brochure, email me now and I'll get one to you. Happy New Year to my many lovely blog readers. I love coming here and posting my creations for you. 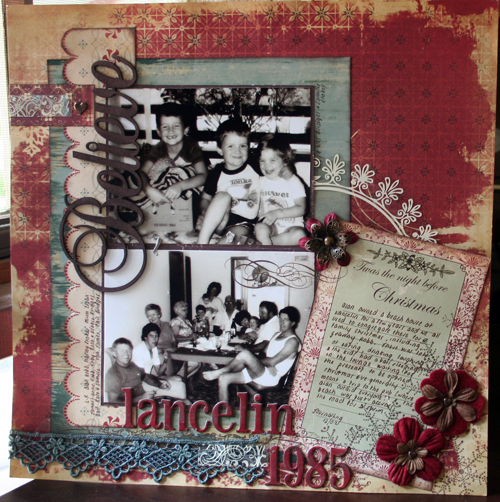 My first year with Stampin' Up! has been such an amazing ride. I feel so good about why we do what we do with Stampin' Up!, and this is reflected in the wonderful friends I have made with fellow demonstrators this year. Can't imagine life without them. I'm off to watch the fireworks from very very high up in the sky on New Years Eve, hope to get a pic or two. So much still to do before Christmas, so what's a girl to do but stamp! 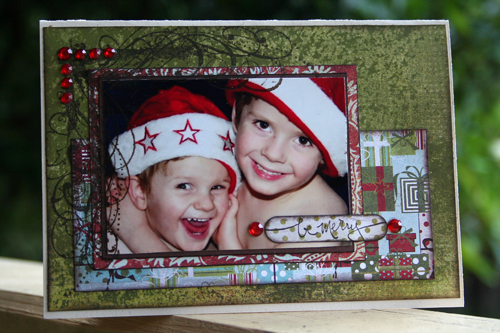 I am ready to move on from Christmas cards now, so am looking forward to getting stuck into the new Stampin' Up! Saleabration and Summer Mini catalogue sets. I am aiming to post lots of samples for you over the next couple of weeks. This set from the Stampin' Up! Summer Mini Catalogue is called Long Time Friend and it's perfect for watercolouring! I am a sucker for anything to do with nature and gardens. I asked Kerri to send me a couple of stamped images of this set after I had seen her cards. I have decided I love it and it's now high on my wish list! 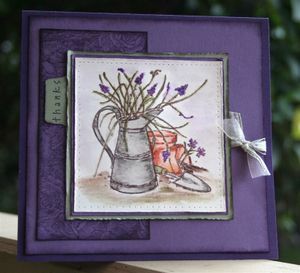 The background cardstock is Elegant Eggplant and Perfect Plum, and I have used the Floral Background Stamp under the image. The contrast cardstock is Mellow Moss. I have coloured the image using a combination of the watercolour pencils and crayons. This cute set is called Merci and you can get it for FREE! It's one of the four sets available exclusively during Saleabration, the annual promotion Stampin Up runs in January and February each year. All you need to do is spend $100 and you can choose one of 4 free stamp sets! There is no limit to the number you can choose (ie spend $300, choose 3 sets etc). These sets are all exclusive to this promotion and won't be available after the end of February. You can also earn yourself a set by hosting a party in your home (or a catalogue party) and reaching a $600 total. If you haven't already been sent a Saleabration brochure showing these great sets, email me today and I will send one out. 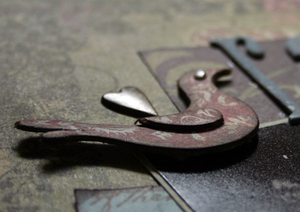 January is also a great month to join stamping up as a demonstrator. Stampin' Up! 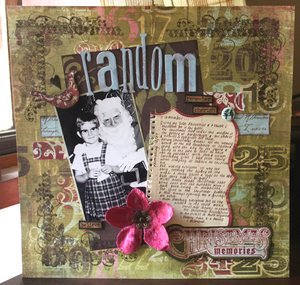 is giving an extra stamp set worth $79.95 in all the starter kits during January and February and if you use the coupon in this months (issue 49) Scrapbook Creations Magazine, you can also get 10% off the starter kit. Email me today and I'll send you the new demo information pack. I can also help you complete your forms, choose your stamps and get on your way to a great start with Stampin' Up! In the busy lead up to Christmas, I hope we can all stop and spare a thought for those going through difficult times at the moment. I have been reminded of this several times over the last few weeks, and I am constantly amazed by the way these people are accepting of where things are at for them at the moment and adjust their lives accordingly. My sister and her family and Daniels partner Jayme are amazing in their unconditional love and support for my nephew Daniel; a friend who has a son with a life threatening illness who is balancing his need for a short stay in hospital with her youngest son's need for sleep school at this busy time because she knows that's what her family needs; another of our scrapbook community has just started chemotherapy. I will be thinking of these people over Christmas and others who need some TLC. I hope you can too. 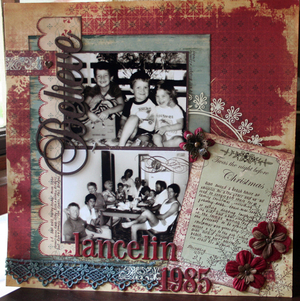 Finished up a couple of christmas layouts I had been working on using pics from my childhood. As you can see I am loving the Collections chipboard birds at the moment! 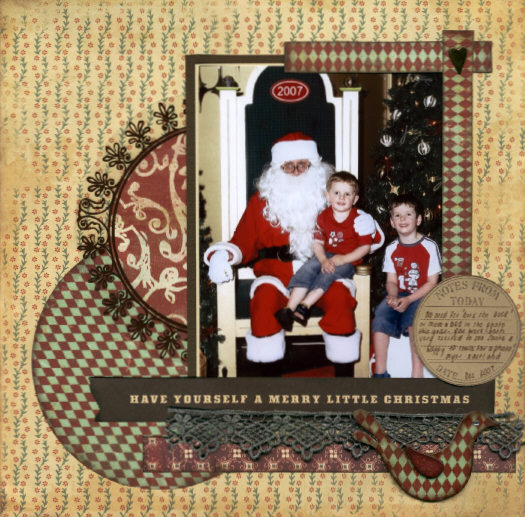 Then today I did this one of the boys Santa photo from this year. I am really happy with the picture this year - no need for Mum or Dad (or 'Dirk' the plastic duck from last year) to be in the photo! Back soon, only 7 sleeps til Santa is here! I've been busy as a bee making more Christmas cards for family and friends. You would think I would have enough with all the ones I had made over the last 2 months, but I found myself needing lots more. 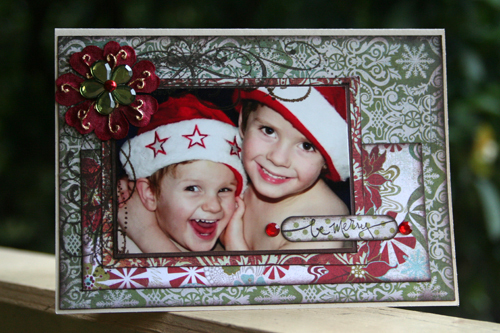 These two are variations of the ones I made for my family with the boys photo on it using Basic Grey 'Figgy Pudding' paper. I used the sentiment 'Be Merry' from Stampin' Up! 's Warm Words set. Their Word Window Punch was the perfect shape for these words. 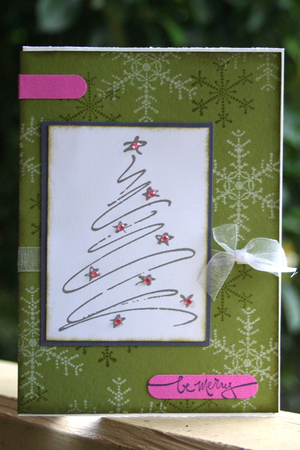 This one uses Stampin' Up's Snowflake Spot set and the sentiment from Many Merry Messages. I am not sure if you can tell that the main snowflake has glitter over the olive stamped image. 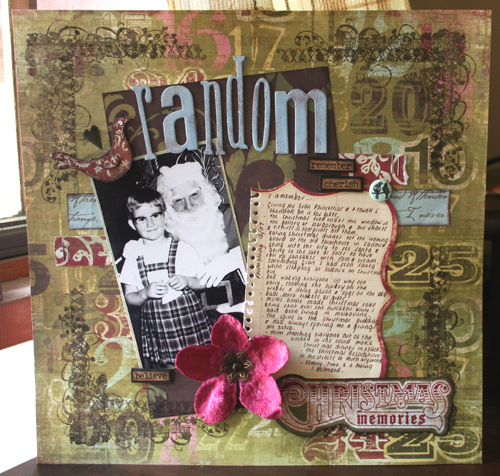 Finally, here's a not so solemn version of Stampin' Up! 's Solemn Stillness set. This tree has been embossed in silver and bling added to each of the stars. I just have some cards for the kinder and creche teachers and my christmas tags to go and I think I'm done! I am sending out the Saleabration brochures and Summer Mini Catalogues this weekend, so if you would like one just email me. I took this pic last weekend while we were putting up the Christmas tree. It seemed to capture their personalities so well. Josh the caring older brother and Sam the cheeky one! 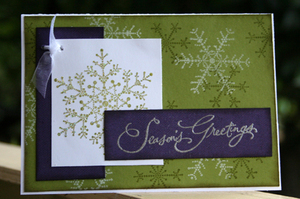 I'm still going on the Christmas cards so will show you those next post. I have also nearly finished a couple of layouts about Christmas during my childhood. These are also going into my Christmas album. Hope you are well and happy. Back soon.